BrigGen Jason Bohm, commanding general of the U.S. Marine Corps Training Command, shared the principles of leadership success with Marine Military Academy Corps of Cadets Nov. 28, 2017. Mission always comes first. Mission is your whole purpose for being at that point in your life. Know your mission, and you will know what you must do each day. Always lead by example. People will follow the standard you set. Set it high. Balanced excellence. Excel in all areas of your life to make excellence a habit. Constantly self-improve. Practice self-discipline, and put in the extra work to grow stronger in your weak areas. Be a man of character. Character is a lifestyle. Do nothing illegal, immoral or unethical. Though recognition and honors may result from success, BrigGen Bohm reminded the cadets of what was truly important. 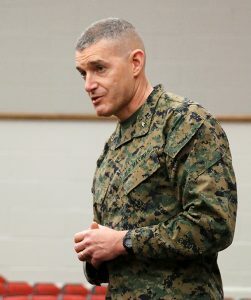 During his talk, BrigGen Bohm repeatedly told the Corps of Cadets to thank their parents for the opportunity to attend MMA. Marine Military Academy is a college-preparatory boarding school for young men in grades 7-12 with an optional post-graduate year. To learn more, visit MMA-TX.org.